NASA has lifted the veil on its plans for a new heavy-lift rocket – one that is expected to be the most powerful ever built – designed to carry astronauts on future deep space missions to destinations like an asteroid and Mars. NASA intends to use the SLS to meet its goals of sending astronauts to an asteroid by 2025 and on to Mars by the mid-2030s. The agency is aiming to launch the booster on its first test flight in late 2017. "I am glad that it uses shuttle and shuttle-derived components, as this is logical. It's too late now, but it would have been advantageous to continue flying shuttle. 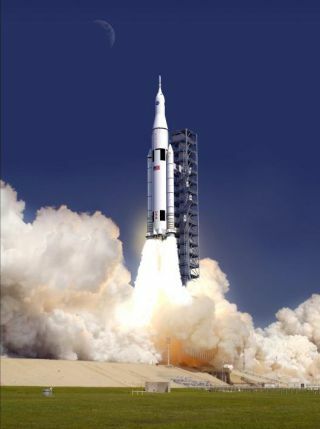 Especially now that the SLS is going to be, at least initially, made from shuttle-derived components." As far as budgets go, the White House clearance for this design implies a commitment to request the budget required for a 2017 launch, and there is certainly reasonable expectation that the Congress will fund the rocket design it proposed. Funding the launch vehicle (a means) does not really clarify the purposes for which it is being built. There is still a pressing need for a clearer plan for how the SLS will be used." "NASA’s decision to select a design for the new Space Launch System, which will use Pratt & Whitney Rocketdyne engines to take astronauts into space, is a positive step to create jobs in the United States and further the nation’s leadership in human space exploration. We are pleased that NASA has selected engine designs with proven heritages of 100 percent mission success, and we look forward to working with the space agency as more details of funding and execution are defined and released. We remain committed to partnering with NASA on cost-effective solutions that bring capabilities on line as quickly and efficiently as possible, while engaging our vital engineering skills to keep the country’s industrial base strong." "This is a great step forward. I am pleased that the White House has joined Congress in committing to a sustained, productive future for the nation’s human space flight program. Our activities in space inspire our young people, create technologies that benefit all our citizens, and sharpen the critical skills that maintain American leadership in science and engineering. "Now that he has been given the go-ahead to proceed, I am confident that Administrator Bolden and the entire NASA team will work hard to incorporate sensible efficiencies in the design, management, and operation of this new system while ensuring that astronaut safety is not compromised. We in Congress and in the White House will need to do our part to ensure that the necessary resources are provided to successfully carry out this exciting endeavor." "The design is not a surprise, no one in the end wanted to start with a clean page because the 800 pound gorilla in the background is the ongoing war over the deficit which is a time of maximum peril for the agency. By recycling in effect the best shuttle technologies, the engines; the hope is to reduce costs enough to make it work plus politically it calms the waters some within the congressional space community. "This decision to proceed with development of the Space Launch System is long overdue. It’s past time that this Administration acknowledged the commitment they made last October when President Obama signed the 2010 NASA Authorization Act. They promised then to deliver a plan to Congress in January – that promise was broken. Then they promised to deliver a plan in 'the Spring’ – that promise came and went. Then they promised a decision in July. Then they announced another ‘Independent Cost Assessment' which added further delay. This Administration’s lack of commitment for human space exploration has frustrated and angered many of us in Congress who are committed to American leadership in space. The Administration’s obstructionism has already resulted in the unnecessary loss of thousands of American jobs, and served to diminish our Nation’s leadership and stature among space-faring nations. It is our sincere hope that today’s announcement signals a breakthrough with this President that will help alleviate the uncertainty that has plagued our aerospace industrial base and wreaked havoc on its employees. We will not judge today’s announcement by the Administration’s words, but by their deeds and actions in the coming months and years." "Why did it take so long? I think it was problematic because there obviously was a lot of transition and upheaval in the space industrial base. If they had gotten this out six months ago I think it would have been helpful for industry to plan and there to have been a sense of moving forward. I think the SLS program is somewhat of a compromise. I would look on it as a glass half full. I don’t know that anybody with a lot of experience or knowledge will be that disappointed. One of the questions is if we’re going to be doing beyond-Earth exploration, does anyone think it’s going to be us alone, or will it involve international partners? Maybe now with SLS decision past us we can focus on practical steps toward international engagement." "Their failure to act forced unnecessary layoffs and a longer gap in America's ability to get our own astronauts to Low Earth Orbit and beyond, making us further dependent on the Russians for access to space. While I am pleased that the new system has been announced, it was long past due and I will continue to push this White House to comply with the law of the land and get America back into space." Rep. Dana Rohrabacher (R-CA), senior member of the House Committee on Science, Space and Technology. "Today, NASA announced its new design for a deep space exploration system, including a new ‘monster rocket’ based on 40-year-old Space Shuttle technology in an attempt to recapture the glory days of the Apollo Saturn V. To meet the challenges of the 21st century we need bold, creative thinking and new technology development, like on-orbit fuel depots. Nostalgic rocketry is not how great nations invent their future. There's nothing new or innovative in this approach, especially its astronomical price tag, and that's the real tragedy. Unfortunately, after a number of years, perhaps during development or after just a few flights like [the Saturn V], budget pressures will bring this program to an end. Jobs that some politicians are bragging today about saving will be gone, while the new jobs based on new technologies and new enterprises will remain uncreated, because we chose repeating the past over inventing the future." "I am pleased that the Obama administration has finally agreed with Congress that SLS is the only viable option to maintain America's leadership in human space flight. However, we have not yet seen the details of this decision. Accordingly, I will continue to monitor this situation very closely to see whether the administration implements the 130-metric ton SLS plan as enacted by Congress. It is my hope to see thousands of our brightest scientists and engineers - in Alabama and across the country - put to work immediately and without interruption to bring this plan to fruition. We simply cannot afford to allow our global competitive advantage in human space flight to erode any further."